In the storage processes strawberries experiencesdetrimental changes so that they can affect the quality of fruit. This change can be detected by testing the physical and chemical properties in particular shelf life period. In generally the measurement of physical and chemical properties are done manually andcausing damage to the object being observed (destructive method). Based on description above, it is necessary to measure non-destructive method using digital image processing. This study aimed to identify the relationship between physical and chemical propertiesvariables and image quality variables (area, height, widht, perimeter red index andblue index) based on 0, 1, and 2 days shelf life using an image processing program. The sample used in this study were 155 pieces strawberry from A quality. The strawberry image was taken by using a CCD camerathen extracted using SharpDevelop 4.2 software. Physical and chemical properties of the strawberry were measured using digital O'hauss pioneer scales, penetrometer, refractometer and pH meter to obtain data on weight, hardness, total dissolved solids and acidity (pH). Correlation test results indicated from strong to very strong relationship between physical and chemical properties variablesand image quality variables with a range of correlation coefficient values from 0,725 to 1,000. Image quality variables that could be used as input for estimating shelf life was blue index, with validation test resulted 87,7%total accuracy. UTARI, Rizky Ramadani Dwi; SOEDIBYO, Dedy Wirawan; PURBASARI, Dian. KAJIAN SIFAT FISIK DAN KIMIA BUAH STROBERI BERDASARKAN MASA SIMPAN DENGAN PENGOLAHAN CITRA. JURNAL AGROTEKNOLOGI, [S.l. ], v. 12, n. 02, p. 138-148, dec. 2018. ISSN 2502-4906. 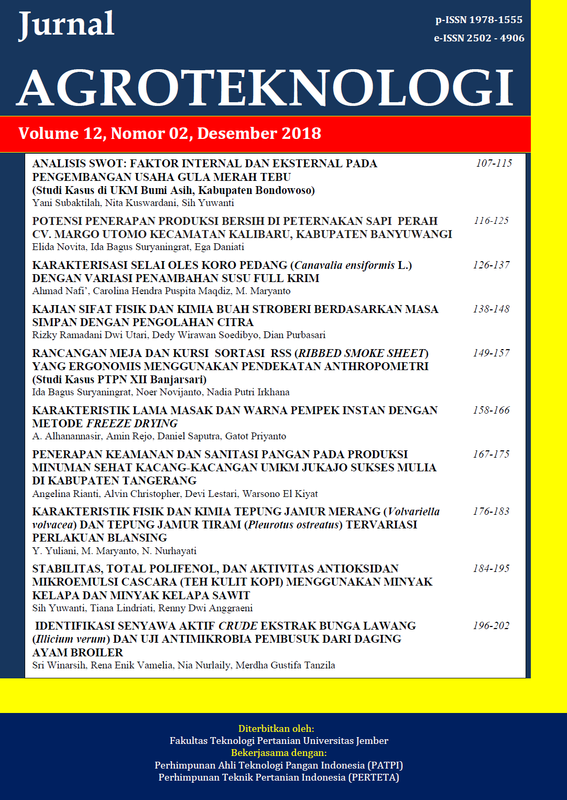 Available at: <https://jurnal.unej.ac.id/index.php/JAGT/article/view/9279>. Date accessed: 23 apr. 2019. doi: https://doi.org/10.19184/j-agt.v12i02.9279.